All IP datagrams must include the standard 20-byte header, which contains key information such as the source and destination address of the datagram, fragmentation control parameters, length information and more. In addition to these invariable fields, the creators of IPv4 included the ability to add options that provide additional flexibility in how IP handles datagrams. Use of these options is, of course, optional. J However, all devices that handle IP datagrams must be capable of properly reading and handling them. The IP datagram may contain zero, one or more options, which makes the total length of the Options field in the IP header variable. Each of the options can be either a single byte long, or multiple bytes in length, depending on how much information the option needs to convey. When more than one option is included they are just concatenated together and put into the Options field as a whole. Since the IP header must be a multiple of 32 bits, a Padding field is included if the number of bits in all options together is not a multiple of 32 bits. Each IP option has its own subfield format, generally structured as shown in Table 58 and Figure 87. 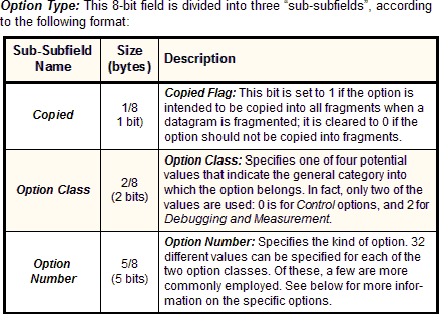 For most options, all three subfields are used: Option Type, Option Length and Option Data. For a few simple options, however, this complex substructure is not needed. In those cases, the option type itself communicates all the information required, so the Option Type field appears alone, while the Option Length and Option Data subfields are omitted. Option Length: For variable-length options, indicates the size of the entire option, including all three subfields shown here, in bytes. Option Data: For variable-length options, contains data to be sent as part of the option. This diagram shows the full field format for an IPv4 option. Note that a few simple options may consist of only the Option Type subfield, with the Option Length and Option Data subfields omitted.